San Francisco Tour Guide Guild was organized in 1984 to provide professional development for tour guides, tour directors, and hospitality workers. Our goal is to provide tour training and certification, networking, and job matching with those needing professional tour guide services in the Northern California Region. So if you are a professional tour guide seeking to advance your career, have a need for a local guide, or just interested in the local sightseeing information we have accumulated, welcome to SFTGG! SFTGG provides a rigorous process for achieving professional certification, developed over time by the many professional tour guides within the Guild. Five different geographical areas are included, from Monterrey to Wine Country, and applicants are tested via both written and oral tests. Usually the process takes over two years. "Better than great! "; "Superb Training, should be required for all guides." Those and many other favorable quotes were offered by the attendees at the Storer Bus Safety training on January 22. Rebecca is a terrific trainer. All attendees were most impressed with Rebecca's and the whole Storer team's contribution to bus safety in San Francisco. A great time was had by all who attended the Member Meetup at Lefty O'Douls yesterday afternoon. Nick Bovis, owner of Lefty O'Douls, set a a delicious spread from their buffet and treated us to come great wine and cocktails. Lots of great conversations, getting to know each other, networking and laughs were had yesterday. It was a great turn out! Turns out that the "new" Lefty O'Douls is a really cool spot!! Thank you again to Jean Feilmoser for getting such a fun event together. An informative time was had by members at the San Francisco International Airport yesterday morning. 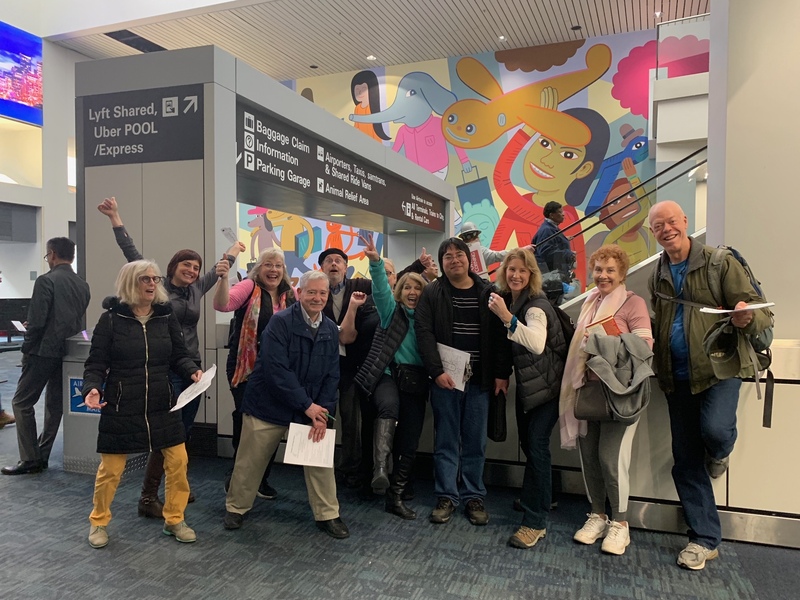 A group of about 10 members was trained by the fabulous Sunny LaGardo and she was a wealth of knowledge on meet and greets, group pickups and departures and all things SFO. I know everyone walked away with several new feathers in their caps yesterday! Sunny gave us the insiders guide to strategic locations to meet groups, how to stay visible to groups arriving, how to work with drivers, best areas to stage and brief groups, how to read/rearrange a manifest to work for you, as well as, the busiest places to avoid, and even "secret", time-saving ways to get from terminal to terminal, where to score free luggage carts and where the medical clinic is located in the International terminal. As well as other great info to have such as where guests can freshen up and find a quiet nap room to where guests can store their luggage or mail a letter, if needed, to the slowest and fastest food/coffee places in the terminals to my favorite, where all the art exhibits are located in the terminals!!! We were lucky to get to gaze at the SIlversmithing exhibit from England and the model airplane exhibit in the museum in the international terminal. This program is HIGHLY recommended for all guides whether you do DMC work or not! There is much to learn and is invaluable as a tour guide, director or working for DMCs! I can honestly tell you that after this training, I feel more prepared to take on DMC and actually think that SFO can be a cool place just to hang out! The 2018 SFTGG Holiday party was held for the third time running at the Italian American Athletic Club. As usual the gathering was a smashing success. New and long time members alike mingled in the festively decorated hall, thanks to Linda Reynolds and her team. Toys for tots again were collected , thanks to Mia, in a Fire Department barrel for the benefit of the Paradise fire victims. Following the plentiful repast, music from the Suzy Q quintet, songs by Suzy Q herself, and a unique if abbreviated performance of the 12 Days of Christmas by Mark Kasulen (CTG) regaled the crowd! Mark happily shares his creation with the intention that guides add some fun to San Francisco holiday season tour. It is a playful song to sing with holiday spirited guests, as the guide intersperses factual commentary of each "Day" throughout the song. "try it and see for yourselves! Mia announced the results of the nomination and election to the 2019 Board of Trustees. The three nominees who accepted their nomination will be formally seated at the first Board meeting in January. Ed Franklin and Garrett Ethridge will each serve a second term, and Suzy Abbott will step on to the Board for her first term. Thanks you to all. Len then introduced the anticipated next President of the Guild, Helen Hickman, who as usual, had enthusiastic words on the Guild and it's members. Retiring members Bruce Marinace, Linda Reynolds and Len Holmes were all thanked for their past dedicated service. Len and Linda have both indicated a willingness to serve on some of the Guild's committees. 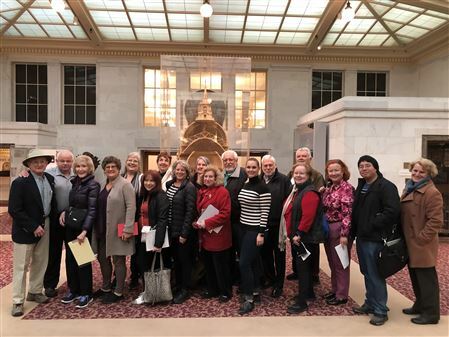 On December 6, 20 enthusiastic guides toured City Hall and the Herbst Theater in the Veteran's Building across Van Ness Avenue. The first phase covered the logistics of doing a tour in City Hall, including the location of interesting photos, statues and busts of former mayors, and a description and discussion of the base isolation systems for earthquake protection. Then it was back to City Hall. City Hall Historian, and docent leader, Ellen Schumer, presented in her delightfully unique fashion many of the interesting details of City Hall and it's history. There will be a sequel to this tour in the spring. It will cover Symphony Hall, Opera House, the War Memorial and the Veterans Building in greater detail. Stay tuned for more info.